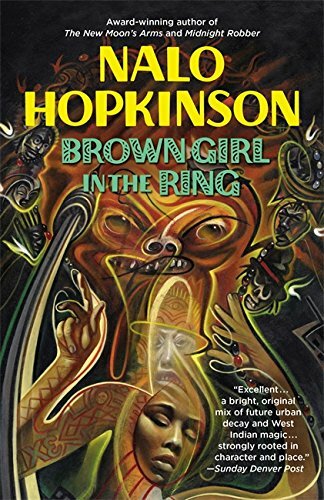 I had an eighth-grade English teacher who revered the first lines of Dashiell Hammett; he would have found much to admire in Nalo Hopkinson: "As soon as he entered the room, Baines blurted out, 'We want you to find us a viable human heart, fast'" (p. 1). And yet what struck me most about the opening pages of Nalo Hopkinson's 1998 debut novel was, to leave behind the 1920s, how fresh they still seemed. This is certainly in part a function of the hardboiled immediacy of that voice; but it's also about something more—and that something is in many ways the beating heart (pun very much intended) of the novel. Brown Girl in the Ring won both the Locus Award for Best Debut Novel and the John W. Campbell Award for Best New Writer in 1999; but nothing about being an award winner guarantees the sort of longevity this book has by now proven itself to have. In 1998, the winner of the Arthur C. Clarke Award was The Sparrow, a book lauded on publication but one which has aged rather badly; in 1999, meanwhile, the John W. Campbell Memorial Award chose as the best SF novel of the year George Zebrowski's Brute Orbits. Yeah, me neither. All of which is to say that Hopkinson's debut possesses unusual currency. It prefigures the work of Lauren Beukes, of Marlon James, of Nnedi Okorafor, and there were moments in reading the novel in which I wondered what took them—what took us—so long to catch up. In the politicized pungency of its violence, Brown Girl in the Ring predicts Kameron Hurley ("Nyx sold her womb somewhere between Punjai and Falen": again, the echoes of opening lines); likewise, its particular treatment of magic realism prefigures the recent short stories of Dilman Dila. "Trail-blazing" has become one of the meaningless tropes of book-blurbing, but Brown Girl in the Ring offers a genuine example of the form. Its precognitions are not all literary, either. From its depiction of a near-future Toronto hollowed out at a broken centre—which reflects with eerie extremity the current experience of Detroit—to its profoundly intersectional themes of power, identity, and solidarity, the novel speaks to our moment somehow with a greater urgency than it may even have done at the time of its writing. "When Toronto's economic base collapsed," we read early on in the novel, "investors, commerce, and government withdrew into the suburb cities, leaving the rotten core to decay. Those who stayed were the ones who couldn't or wouldn't leave. The street people. The poor people. The ones who didn't see the writing on the wall, or who were too stubborn to give up their homes" (p. 3). In our own age of economic turmoil, in which bankrupt cities walk, Wile E. Coyote-like, on the thin air of late capitalism, Brown Girl in the Ring feels less like a missive from the future and more like a fabulated version of a life that might be being lived now, down the street or around the block. Certainly there is a need for this medicine: in the vacuum created by the withdrawal of the Ontario government from the centre of collapsed Toronto, the crime lord Rudy has assumed power, ensconcing his wicked empire at the top of the CN Tower. It is he from whom a viable heart is demanded at the opening of the novel, by an aide to the increasingly sickly state premier: her advisors plan to win her the next election, which is falling away from her, by cobbling together a coalition of voters centred on abolishing pig transplants—and for this she must be the first to break a recently acquired taboo on human ones. In this way, crime and politics are shown to be conjoined elements in a system of corrupt oppression which forces upon the people of the Burn violence, degradation, and drug addiction. In all this, Brown Girl in the Ring is part of the same 1990s milieu that gave rise to the work of David Simon: his Baltimore, too, was victim to a dozen different, but uniformly negative, pressures. That is, the novel isn't just prophetic, but embedded in a set of events and historical or cultural processes developing at, and familiar before, the time of its writing: of the Bronx and apartheid, and indeed the sufferings and dispossessions of Canada's indigenous peoples, whose lawsuits in the novel precipitate Toronto's economic collapse. This thematic connection not just to abstracts but also to geographically and politically separate instances of the process of marginalization the novel inspects is, as much as its prose and its percipience, central to its continuing freshness: it is not shackled to analogy, but works as myth and metaphor. Indeed, Ti-Jeanne is a feminized version of the title character in Derek Walcott's play about good versus evil in Caribbean legend, Ti-Jean and his Brothers. Instead of the fraternal trio at the centre of that work, from which many of the novel's sections take their epigrams, Hopkinson offers us Ti-Jeanne, her grandmother, and her mother—absent as the novel opens, but a figure who becomes more and more central to its motivating events as we read on. The women are fenced in (just as the Temagami are trapped by colonialism or Rudy's henchmen by the will to power) by patriarchal structures, and most specifically by the abuse and disrespect they have received at the hands of the men in their lives. Each of the women and their choices have been shaped by these pressures, and often in such a way that they replicate them: Ti-Jeanne's upbringing is strict and its rules are imposed by force. Ultimately, it is Ti-Jeanne's task to find a way to assert her independence in every way, in order to break this sterile cycle: "[I'm] Mad like that old woman jumbie thing who used to be my mother," she realises just over halfway through the novel. "I mad at all of allyou for making me run around trying to save allyou, but allyou just digging yourselves in deeper, each one in he own pit" (p. 165). This kind of dilemma forms the backdrop to the question the novel asks of its characters and society: how to do things better? Hopkinson's demand that we try harder gives the novel its momentum and its vitality. The Wire is a document composed by both a journalist and an outsider, and it consequently exhibits the despair of reportage; Hopkinson's novel offers hope and strength to the communities it represents. Despite the ingrained cynicism—even hostility—that some in her community espouse towards Gros-Jeanne's magic, its efficacy, and the non-exploitative means by which she dispenses it, begins to give back to the people of the Burn both agency and self-respect. "The African powers, child," Gros-Jeanne explains when asked about the origins of her practices. "The spirits. The loas. The orishas. The oldest ancestors. You will hear people from Haiti and Cuba and Brazil and so call them different names" (p. 126). That is, banned names, disparaged religions, suppressed beliefs; a diasporic culture which has answers better than the hegemonic one that has so reduced the people of the novel and the Burn alike. Brown Girl in the Ring makes Eshu and Legbara, Jab-Jabs and duppies, central characters; it gives them agency and energy, and shows how their re-adoption or reassertion offers the same for its characters. As much as through politics, change for Hopkinson starts here. Toronto is one of the most multicultural cities in the world, and in this way makes a perfect setting for Hopkinson's postcolonial redemption story. When Ti-Jeanne listens to crowds in the Burn, she hears many voices: "Mostly Caribbean English, but some spoke Spanish and others the African-rhythmed French of the French Caribbean islands" (p. 87); the state premier cares little for these communities as long as she can win elections in other ways. They are thus abandoned and ignored, left to the untender mercies of Rudy, a crime lord who is also shown to be the evil reflection of Gros-Jeanne, a sorcerer who traps spirits with spells—and uses them to unleash unspeakable magics on his enemies. Some of the novel's most memorable scenes involve hideous violence wreaked by Rudy: in one such passage, he skins a zombie-slave alive in front of a paralysed Tony, who is obliviously father to Ti-Jeanne's child and a weak man who is therefore deeply dangerous to the women in his life. Hopkinson does not spare us these mental images because she is intent on emphasizing the horror of corrupted power structures: Rudy first gained his power because a spirit did not believe he would stoop to the depths necessary to gain his arcane knowledge. We, goes the implication, should not make the same mistake when faced with men who crave to dominate. "There's another thing, too. We're going to rejuvenate Toronto." "Premier, you know that project has always been death to politicians. No one's been able to do it yet." "Yeah, 'cause they've tried it by providing incentives for big business to move back in and take over. We're going to offer interest-free loans to small enterprises that are already there, give them perks if they fix up the real estate they're squatting on." "What small enterprises? The place is a rat hole, complete with rats." This is a first novel; we should allow and forgive a bit of patness, even some over-neat didacticism. Certainly Brown Girl in the Ring's ending feels a little rushed and a little too happy; its epigrammatic structure doesn't always seem to add a great deal to proceedings; its pacing is occasionally off. Most surprisingly, its treatment of queerness is a bit timid. There's an argument to be made that the novel isn't quite a classic because it has in this way all the characteristics of a neophyte's first stab. But then there's that freshness, that electricity. This is a novel now almost eighteen years old and it still fizzes. Classics, too, have been made of lesser stuff. You might be surprised to learn that, at the end of the novel's central threefold line of women, Ti-Jeanne's own child is not a girl but a boy. He remains nameless throughout the novel, and the book ends with Ti-Jeanne on her front step, cradling him in her arms. "So, bolom baby" (p. 247), Ti-Jeanne says to him, "what we going to name you?" It has taken three generations, and a near-fatal reach for independence, to arrive at a point at which these women may have nurtured a new sort of child for a new sort of world. It might feel odd for the novel to end on the potentialities of a man; but, unlike in the case of the son of Hammett's poor Paulette Key, there is a path open to him other than the one followed by his father and grandfather, and therefore for the society he is part of. All this is thanks to Ti-Jeanne and her sisters. Brown Girl in the Ring remains fresh because it remains hopeful. Dan Hartland's reviews have appeared for some years at Strange Horizons , as well as in publications such as Vector , Foundation , and the Los Angeles Review of Books . He blogs at thestoryandthetruth.wordpress.com.